New York: Mark H. Newman & Co., 1847. 362 pp., numerous illustrations with two folded illustrations, one of which hand-colored. I must admit to a fundamental weakness for the writings of pre-Darwinian scientists, especially in their efforts to reconcile Genesis with geological and paleontological evidence. Edward Hitchcock (1793–1864) and Hugh Miller (1802–1856) are among my favorite authors before November 24, 1859 (the exact publication date of Darwin’s On the origin of species), for their books are intelligible attempts to balance religion and natural history. One of Hitchcock’s most successful publications is entitled Elementary geology, appearing in 32 (!) editions between 1840 and 1870. I adore Elementary geology for one simple reason, its hand-colored “paleontological chart,” neatly folded in my copy before reviews of earlier editions and the title page. J. David Archibald, of San Diego State University, systematically explains the significance of this chart in a paper in the pages of the Journal of the History of Biology (volume 42, number 3, pp. 561–592). 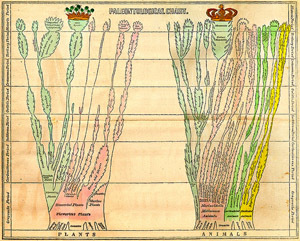 Simply put, Hitchcock’s sees his chart as an elegant graphic illustration of accumulated paleontological data — making it one of first successful efforts to explain the history of life over time on this planet on a single printed sheet. It is worthy of analysis by none other than Edward Tufte. It’s not surprising that the chart vanished in all editions of this work published after the appearance of On the origin of species. Hitchcock, and his son, were not ready to provide unintentional ammunition to Darwin and his supporters. My collection includes several other works by Hitchcock, including his magnificent Ichnology of New England (1858) and Supplement to the Ichnology of New England (1865) on the dinosaur trackways of the Connecticut Valley. However, I really prize Elementary geology because of that beautiful chart. It has been rebound fittingly in blue half leather with marbled boards, appropriate protection for that miraculous folded graph. Final report on the geology of Massachusetts. Amherst: J.S. & C. Adams, 1841. Four parts bound in one volume, 831 pp., with 275 woodcut illustrations (Figure 30 hand-colored) and 55 plates (portion of plate 54 hand-colored). It was plate 45, a lithographic illustration of fossil footprints, known in 1841 as “Ornithichnites or footmarks of extinct birds”. The plate was matted, in a bin of a now extinct print shop on Chartres Street in the French Quarter of New Orleans. With a little research, I tracked down the source of the plate, Edward Hitchcock’s magnificent Final report on the geology of Massachusetts. Such a terrible title for such a romantic, breathtaking book! The Final report really is a long, rambling, delightful love letter to Massachusetts, its geology, landscapes, shorelines, mountains, islands, and residents. Hitchcock could have certainly taken the title of one of Lord Bryon poems, “She walks in beauty” (1813), and renamed this book, “Massachusetts walks in beauty.” It would have been a more fitting heading than Final report, a work taking Hitchcock, and his artistic wife Orra, over 10,000 miles around the state and a decade to complete. Orra created many of the illustrations in this work, so valued by print dealers, ever ready to guillotine this book into so many frameable moments. In addition to details on Massachusetts’ natural beauty, this document includes some of the most extensive early descriptions of what we now know as dinosaur tracks from the Connecticut River valley. 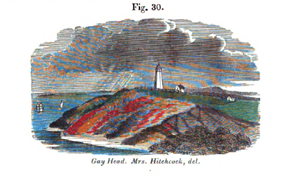 Hitchcock was to devote considerable energy into deciphering these Mesozoic records, leading to his fabulous books Ichnology of New England (1858) and Supplement to the Ichnology of New England (1865). Three of the earliest uses of photography in scientific books in the United States — John Collins Warren’s (1778–1856) Remarks on some fossil impressions in the sandstone rocks of Connecticut River (1854), J. Deane’s (1801–1858) Ichnographs from the sandstone of Connecticut River (1861), and Hitchcock’s Supplement (1865) — all were dedicated to solving the track puzzle in New England.